This intimate, joyful, haunting portrait of playwright Maria Irene Fornes shows art and friendship enduring in the face of forgetting. We actually decided to make this documentary film more than a decade ago, when a dear friend – the playwright, director and teacher Maria Irene Fornes – had stopped writing due to dementia. While Irene (what she prefers to be called) was no longer able to string sentences together on a page, we discovered that talking to a camera could be another form of writing. The discovery happened by accident one day on Brighton Beach, with a never used Hi8 camera. I wasn’t a filmmaker, but her response to the camera was so astonishing that I quickly became one. Irene is fierce, hilarious, playful, incredibly wise and endlessly compelling. I know her in real life and you will only meet her on film, but the 80 minutes you will spend with her will change you just like she changed me. You’ll start to watch, and then you’ll be so captivated by Irene that you won’t be able to stop. You’ll want to know how someone can remain so radiant and lucid and vital and alive, even as her memories are eroding. You’ll want to know how she can form such a strong relationship with her young friend, an aspiring writer (me), and you’ll want to get inside of that relationship, join us in it. The film lets you do that. If we’ve done our job editing, you’ll want to know how the story ends. And hopefully, you’ll hope it doesn’t. At the heart of this documentary is a deeply personal story about the power of friendship and creativity, and what it means to remain an artist through all the vicissitudes of one’s life. But this film also confronts a prevailing attitude about aging and Alzheimer’s disease that I feel passionate about challenging, and that I believe needs to change. In our society today there’s a pervasive view—and it confines multitudes of elders still capable of meaningful relationships to lives of invisibility and isolation—that people lose their value as they lose their short-term memories. The Rest I Make Up counters that assumption by inviting us to live for a while with an irrepressibly vital and generative playwright who­­—even in the face of eroding memory, even as she no longer formally writes and teaches­­—is experiencing a remarkably creative period of her life. 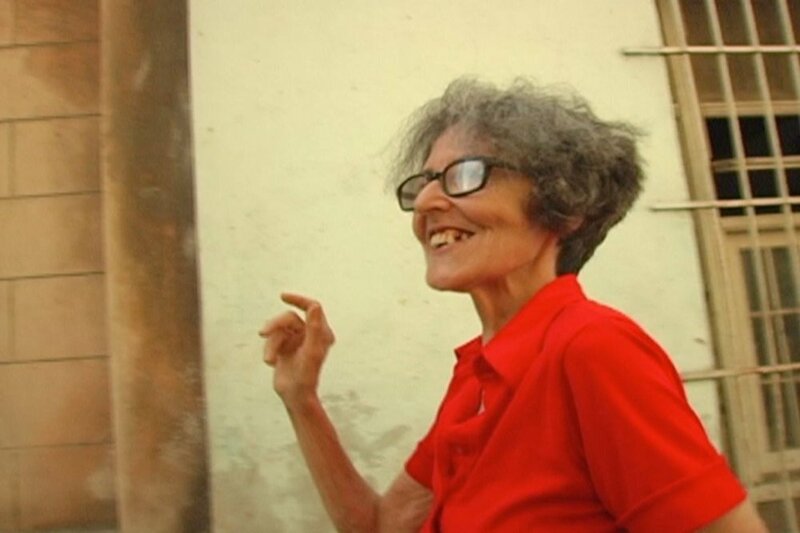 THE REST I MAKE UP: Maria Irene Fornes - Irene dancing in Cuba. There was never any script, mostly because Irene and I never intended to actually make a film. We just kept shooting and shooting, as if we were writing pages and pages of dialogue for a play, just letting it unspool. And then when I finally sat down – after several years and hundreds of hours of footage – with the fabulously talented editor Melissa Neidich, we just let the best moments guide us. The story-making process was incredibly associative, very intuitive. We found that the closer we listened to Irene herself, and followed her lead, the stronger the film became. We’ve recently screened the rough cut for small groups in LA, Seattle and Chicago, and I just can’t believe how inspired and captivated audiences are by Irene. I mean – I can believe it because I fully experienced it, but you never know if or how that will translate to others. At first I thought only theater people would really get the film, but I was wrong. Everyone is taken in and affected by it. Right now we’re at a very crucial point with the film. We’ve spent a year editing, we have an 80-minute rough cut, and now we’re doing a Kickstarter campaign to raise the money to finish it. We’re so close to getting this film out there into the world, and we want everyone to know about it! Our film is all about visibility, about shining a light onto a topic, a person, a relationship, a life that would normally have been left unseen and unforgotten. Anything we can do to share this story—Irene’s story—with a larger audience is our aim! Right now we’re looking for journalists to come on board and help us get the word out about the fundraising campaign. Soon we’ll be looking for sales agents, buyers, distributors, and film festival directors, but right now we’re totally focused on getting the film funded and finished! THE REST I MAKE UP: Maria Irene Fornes - Maria Irene Fornes and Director/Producer Michelle Memran. In a perfect world I would like this film to do two things: To make people want to learn more about the life and work of Maria Irene Fornes, maybe even go out and get her plays and read them; and to give people hope and inspiration by offering creative alternatives to dealing with dementia. What happens to artists when they lose the very ability that made them an artist in the first place? How do they go on? How do they retain their identify? Director/Producer Michelle Memran is a journalist, artist and filmmaker. The Rest I Make Up is her first film. Executive Producer Piece by Piece Productions is a not-for-profit organization that was started in 1999 by Wendy vanden Heuvel. Producer Katie Pearl is an OBIE Award winning theater artist and the co-Artistic Director of the multi-disciplinary performance making company Pearldamour. Producer Heather Winters is an award-winning film producer, director, writer and executive producer.